It's a beautiful sunny day here, so what do I have planned? This morning I'm going to dye some yarn for toy outfits, while working on more fuzzy farm animals. 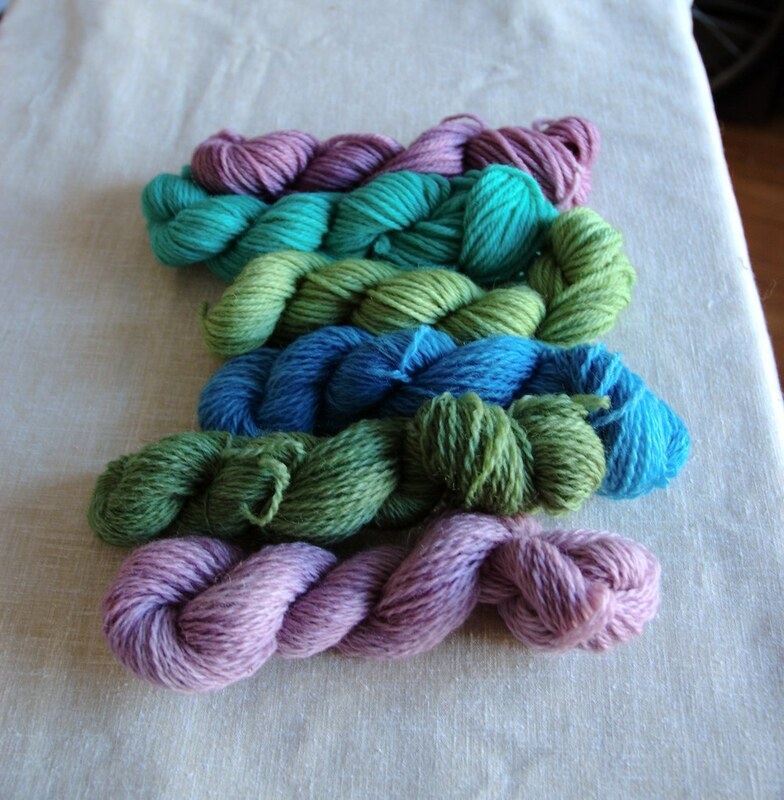 Dying yarn is always a big production (but fun) so I try to do a bunch of skeins at a time. I have nothing specific in mind, but I'm really low on nice colours for clothes, so I'll just make a rainbow of 25g skeins in different weights. Then lunch! Maybe I'll sit out on our balcony with the kitties, taking in the sun and good smells of new leaves, blossoms, and cut grass (it seems too early for that, but some people are so fanatical about their lawns). This afternoon, computer work. *yuck* :P But it needs to be done. I want to get the revisions of the lamb pattern done, and maybe a couple of others as well. I don't want people to worry about these too much! The toys will look just the same, I'm just moving around some of the shaping stitches so the finished toys will look good without so much fussing around with getting the stuffing just right etc. This is a result of not really knowing what I was about when I started writing patterns, never having them tested, and being a bit perfectionist. If you're curious, download the new lamb pattern when it's done to see what's different. But I really can't replace old copies of bought patterns. I feel faint just thinking about how much work that would be! I really hope you understand. Then, as a reward, I'll go to the gym! Really, that's how it feels. After sitting around on my duff all week, getting some exercise feels like the best thing I could do on a Friday afternoon. Your yarn colors are absolutely beautiful! May 12, 2008 at 8:49 p.m.